It’s always a pleasure being able to review the music of a band I love. Getting to hear a track before it is released to the public, the thrill of hearing a new song for the first time, and having it delivered straight to my inbox personally, by a member of the band, is both a privilege and an honour. 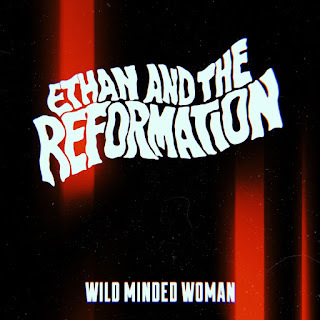 Moreover, being able to publish my thoughts and feelings about a brand-new song is genuinely thrilling, and the latest single by Manchester Psychedelic Rock band Ethan and The Reformation is no exception. Wild-Minded Woman is a step into new territory for this band. Casting aside their psychedelia on this number, the song is pure unadulterated Rock and Roll. It only took listening to a couple of bars to realise that the band are having fun with this song; taking their sound back to a basic Rock level and yet embellishing it. All leads and hooks are done on guitar in a very classic rock style which is stripped-back and very 70s in its delivery, but with a fresh and contemporary sound. It is simple in its use of chords but sophisticated in structure, in a way which effortlessly showcases each band members’ skill and ability. The instrumentation is both solid and beautifully layered with three guitars and the added use of a saxophone brings a playful and soulful element to the instrumental section midway through the song. Ethan’s vocals never fail to disappoint and are truly unique on the current Manchester scene. Here his voice remains confident, defiant and bold. I think this track is a metaphor for being in the right place at the right time, with everything at your feet. I feel like it’s about knowing who you are, what you have and feeling good about that. It’s a feel-good song, a song that brightens my day when I hear it, makes me smile, and gets my feet tapping. What a fantastic comeback single this is and I for one am very happy and excited to see it unleashed to be bought, streamed, but mostly to be performed live as all good music should. Curious? Just play the video and see for yourself. Ethan and The Reformation are playing a free gig just three days before Christmas at popular Manchester Northern Quarter gig venue, Jimmy’s on December 22nd.